This is the first game in the Thief series. For other games in the series see the Thief category. 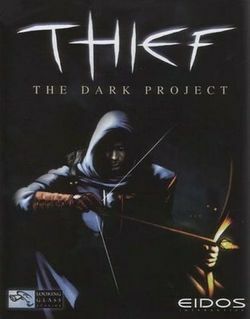 Thief: The Dark Project, or Thief, is a first-person Stealth game developed for Windows by Looking Glass Studios and published by Eidos Interactive. Released in 1998, it is set in a medieval steampunk metropolis called the City. The player assumes the role of Garrett, a thief trained by a secret society, and undertakes missions to steal valuables. It was the first stealth game to use light and sound as gameplay mechanics, and the first to feature a first-person perspective; its use of this perspective for non-confrontational gameplay challenged the first-person shooter market. The game's design combines complex artificial intelligence with simulation systems to allow for emergent gameplay. Thief's influence has been traced to later stealth titles, including Tom Clancy's Splinter Cell and Hitman. Thief takes place in a metropolis called "the City", which has been noted to contain elements of fantasy, the Middle Ages and the Industrial Revolution. The setting has been described as "steampunk", a fantastical setting where steam technology is prominently used. During levels, the player may learn about the setting by finding notes and overhearing conversations; it has been noted that the player participates in the revelation of Thief's setting. The City contains three factions: the Keepers, and two opposing religious orders known as the Pagans and the Order of the Hammer. The Order of the Hammer, whose followers are called "Hammerites", and Pagans represent the forces of order and chaos, while the Keepers are a neutral, secretive society that strives to maintain balance within the City. Hammerites worship a benevolent deity called "The Builder", and believe in righteousness, progress and craftsmanship; the Pagans, who worship the dangerous "Trickster" and value the natural world, have been called "primitive, almost animalistic". It has been assessed that the design of each group's architecture reflects their beliefs. This page was last edited on 8 July 2016, at 20:31.